The 800 Polaris® TITAN™ Adventure is fully featured and is the true do-it-all sled. It comes with a Lock & Ride® Versa Touring Passenger Seat with heated passenger grips and passenger footrests, cargo rack, cargo box, tow hitch, mirrors, Polaris Interactive Digital Display, premium FOX Shocks, Cobra track with 1.5 inch lugs, PRO-FLOAT skis, and a 24 inch high windshield that provides outstanding rider protection. TOWING & CARRYING CAPABILITIES: TITAN models offer unmatched cargo carrying and towing capabilities, and with a 1,200 lb. (544 kg) towing capacity, they can tow more than competitive sleds. Innovative storage solutions optimize available space & utilize impressive Polaris® TITAN™ hauling power. Integrated cargo mounting systems let riders add or remove cargo quickly & easily. Sled is engineered to maintain its Rider-Balanced Control with any size cargo load. POLARIS TITAN ALPHA TRANSMISSION: The durable, reliable TITAN Alpha transmission provides smooth shifting and drive ranges to suit even the most extreme conditions or situations. Delivers smooth shifting and 1200 lb. towing capabilities. Drive Ranges: High, Low, Reverse, Neutral. Engineered & built to perform reliably when towing & hauling large loads. INTEGRATED LOCK & RIDE VERSA STORAGE PLATFORM: Innovative, Polaris TITAN-exclusive storage system optimizes convenience and security of carrying cargo. Industry-leading carrying capacity of 85 lb. (38.5 kg.). Integrated design allows for maximum storage, with or without passenger seat. Platform designed to hold two 5-gallon buckets, ideal for hauling fishing gear, tools, firewood & much more. Integrated Lock & Ride® mounting system to hold accessory cargo box. Includes bars where tie-down straps can be attachedRibbed underside of platform perimeter prevents bungee hooks from sliding. LOCK & RIDE VERSA STORAGE CARGO BOX AND RACK: Lock & Ride® Versa Cargo Box and Luggage Rack are available as accessories for the Titan SP model and keep cargo secure and protected. They are engineered for quick, easy mounting on the Lock & Ride® Versa Storage Platform. Lock & Ride® Versa Cargo Box can be installed/removed in seconds without tools and provides an outstanding capacity of 4,140 cu. in. This weather-resistant Cargo Box keeps cargo secure & protected and can be used with or without the Luggage Rack. Lock & Ride® Versa Rear Luggage Rack easily mounts to the platform and allows for attachment of multiple accessories for added functionality. POLARIS TITAN CARGO ACCESSORIES: Storage solutions are available for every type of cargo you need to carry. Every bag and carrier features durable, all-weather construction and easy, secure installation. Accessory cargo bags available include: Handlebar Bag, Windshield Bag & more. Kolpin® Quick Attach Gun & Rod Lockers hold firearms & fishing gear securely. Ice Auger Mount makes it easy to transport ice fishing equipment. INTEGRATED 1500 LB. WINCH ACCESSORY: Versatile, mobile pulling power is available everywhere you ride with this powerful integrated winch. Powerful, durable, reliable winch built for demanding conditions & jobs. 1,500 lb. (600 kg) line pull rating. Versatile pulling power available on-demand. Can be operated with the sled engine idling or the engine off. Winch can be mounted on the rear of the sled. Can be mounted on a sled with accessory bumpers. Use the winch power to free stuck vehicles, move large items, tackle tough jobs. 14 GALLON FUEL TANK: This high-capacity fuel tank will provide extended range and will provide those who ride far off-trail with extra peace of mind. Large capacity minimizes need to carry extra fuel, freeing up storage space for other cargo. FOX QS3 CLICKER SHOCKS: High-performance, adjustable, and rebuildable FOX® QS3 Clicker shocks offer easy pre-ride adjustability and deliver outstanding performance on- and off-trail. Tool-free adjuster allows for simple and repeatable suspension setting changes. Wide range of compression adjustment provides noticeable changes of ride quality and handling without the complications of counting detents. Remote reservoir promotes heat dissipation & ensures consistently outstanding performance in all riding conditions. AXYS RIDER-BALANCED CONTROL: The AXYS® TITAN Chassis positions the rider for Rider-Balanced Control in all riding situations – solo, 2-up, with cargo on-board, or towing a load. This platform delivers unmatched ride & handling on- and off-trail. Balanced handling on all terrain. Superior mobility, agility and performance in deep snow. Ride & handling are not compromised when hauling or towing cargo. 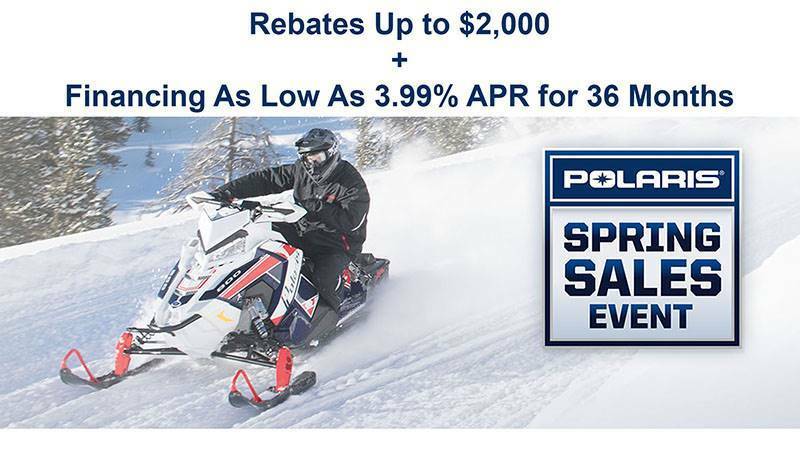 POWER BOOSTING REGULATOR: The Power Boosting Regulator is a new, innovative electrical power technology adapted from the automotive industry and available exclusively in Polaris TITAN snowmobiles. Delivers maximum electrical power at idle and low RPMs. Ensures electrical power for rider comfort and convenience features, such as heated seats, handwarmers, battery charging and other accessories. Easy starting. POLARIS TITAN ARTICULATED REAR SUSPENSION: The Articulated Rear Suspension provides outstanding ride & handling in all conditions, on- and off-trail. Delivers a smooth ride on trails and can absorb the bumps off-trail. Superior ride & handling. 16.5” of rear travel ensures a smooth ride on the trail & outstanding off-trail capabilities. Suspension geometry is optimized for a great ride & sure towing. No adjustments required to switch between solo & 2-up riding, or when hitching on a large load. Rear section of skid tips up for easy backing over obstacles. Enhances the sled’s outstanding flotation. POLARIS TITAN COOLING SYSTEM WITH RADIATOR: This durable, efficient cooling system and radiator ensures consistently reliable engine operation in even the most extreme conditions. World’s most robust performance snowmobile cooling system. Ensures reliable engine operation when sled is being ridden in extreme or low-snow conditions. Cooling system includes an efficient radiator with fan. Radiator is mounted in strategic position for ultimate cooling airflow and minimal snow or debris build-up. Add the accessory Wheel Kit for maximum low snow capabilities. POLARIS TITAN BRAKE SYSTEM: Industry’s only integrated brake with an integrated idler shaft for brake disc. 4 piston caliper. Radial master cylinder. POLARIS TITAN POWDERTRAC RUNNING BOARDS: The PowderTrac Running Boards offer an optimized design for maximum snow clean out while maintaining extreme strength. Engineered for optimal strength. Expanded cut-outs minimize snow & ice build-up. Designed to provide comfortable ergonomics for seated & stand-up riding. Top surface designed for outstanding boot grip the entire length of the running boards. Accessory closeouts available. 20 X 155 X 1.55 COBRA TRACK: Proven, versatile Cobra track provides excellent off-trail flotation and aggressive traction on-trail. Lugs have a cupped design for outstanding off-trail performance and flotation. 1.5” Lugs height offers balance between off trail deep snow and on trial handling performance. Strong, stiff lugs won’t fold over like some deep snow tracks’ softer, more pliant lugs. HIGH-EFFICIENCY INTAKE AND EXHAUST: Porous intake duct material and high-flow exhaust system create a better breathing engine package for more power. The silencer provides reduced sound levels while on the trail. Vforce reeds provide improved performance, throttle response and reed durability. LIGHTWEIGHT CRANKSHAFT: Lightweight crankshaft weighs 2.5 lbs less, delivering 25% lower inertia and quicker throttle response and spooling. This provides improved acceleration. Designed and engineered specifically for the 800 Cleanfire® H.O. Engine for increased durability, this same lightweight crankshaft is used in Polaris Race sleds, including during the past 2013-14 and 2014-15 seasons, showing it's proven durability. 800 CLEANFIRE H.O. ENGINE PISTON: Grooved piston was designed specifically for the 800 HO Cleanfire® Engine to increase durability and engine life. PRO-FLOAT SKIS: The strong, lightweight PRO-FLOAT Skis provide outstanding off-trail flotation and unmatched on- and off-trail steering and control. PRO-FLOAT skis are 9.5" wide and offer a combined surface area of 410 sq. in., more than 45% greater than Polaris PRO-STEER skis. These skis feature a unique dual stepped keel design that provides more responsive deep snow handling as well as outstanding handling on the trails. The upturned rear edge accommodates backing up over obstacles, and the serrated top of the ski provides traction for a rider’s boot. LOCK & RIDE VERSA TOURING PASSENGER SEAT: The Lock & Ride® Versa Touring Passenger Seat comes standard on the TITAN Adventure model. Passenger Seat features passenger handwarmers & RCA plug (cord sold separately). Quick install. Also available standard on the Polaris® Titan™ Adventure, Passenger Footrests to enhance passenger comfort & security. EXTENDED WIND PROTECTION & AXYS EXTRA TALL WIDE 24 IN. WINDSHIELD: Polaris TITAN's integrated wind protection enhances riders’ comfort. Extended AXYS Wind Foils deflect wind around riders. Wide, extra tall 24” windshield provides the ultimate protection for the most extreme conditions. ELECTRIC START: Standard electric start. Durable starter built to withstand the rigors of coldest climates. Start the powerful engine with the push of a button. POLARIS INTERACTIVE DIGITAL DISPLAY: Another industry first for Polaris - the most advanced instrumentation in snowmobiling. This 4.3" high resolution, full color, LCD digital display provides a rider with information. Sled performance: Speedometer, tachometer, dual tripmeters, average speed, max speed, engine/trip hours & odometer. Sled operating conditions: Coolant temperature, diagnostics & maintenance warnings. Riding conditions: Air temperature, time of day in 12 or 24-hour clock format. Bluetooth™ functionality: Enables the gauge to communicate with the rider’s cell phone and provide notification of incoming calls or texts. Displays phone battery & signal strength. GPS/Mapping Capability: A compass is standard, & full-featured GPS can be installed to provide directions & information about services such as fuel, restaurants, lodging & Polaris dealerships. Customize the GPS to operate with North Up or Course Up navigation depending on your preference. Ride Planning Feature enables you to plan a ride using Ride Command, save it as a GPX file, and transfer it to the display through the USB interface. This gauge comes standard on the Polaris Titan Adventure, and is available as an accessory option. ACESSORY HEATED SEATS: Heated driver and passenger seats are available as accessories for extra rider comfort in extreme conditions. Heated Driver Seat & Passenger Seat available as accessories. Heated seats install quickly & easily; internal heating elements connect to sled’s electrical system for power.